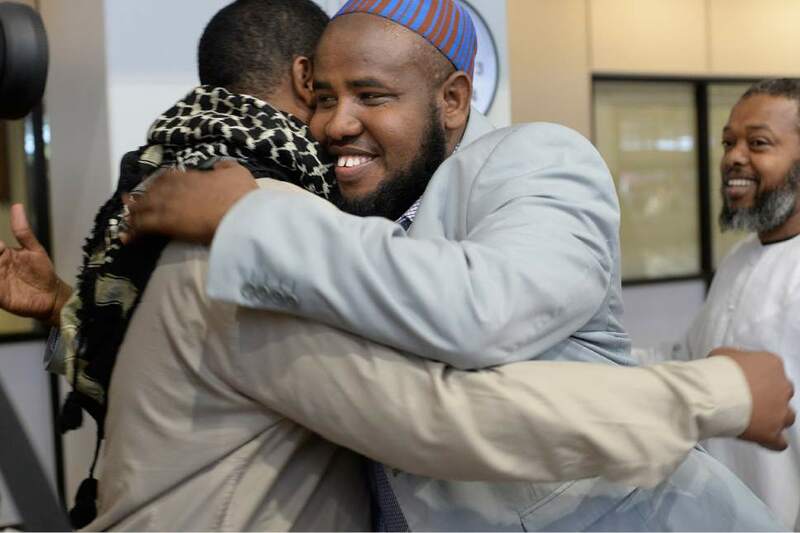 Scott Sommerdorf | The Salt Lake Tribune Imam Yussuf Awadir Abdi gets hugs from friends after he arrived at Salt Lake City International airport, Sunday, June 18, 2017. This is your captain speaking: "We will not separate the family." Thus was the family of Yussuf Awadir Abdi allowed to board the aircraft for the last leg of their frightening and convoluted flight from Kenya to Salt Lake City. Whoever  or whatever  was responsible for this bureaucratic nightmare needs to be found out, exposed and left unable to do it to any other innocent travelers. Last Wednesday, Abdi, his wife and their five children were about to get on an airplane in Nairobi for their journey home from Kenya. The rest of the family was allowed to board but local officials told Abdi that he was barred from the flight. With assistance from the Council on American-Islamic Relations and the Refugee Justice League of Utah, and an intervention from the U.S. Attorney&apos;s Office in Utah, whatever legally and constitutionally questionable hold had been put on the imam from Salt Lake City was lifted. Even back on American tarmacs, the family missed two more connections when another round of questioning and an unexplained move to stop Abdi&apos;s wife from boarding held things up. The last barrier was removed, according to Abdi, when the American Airlines pilot took the name of his carrier seriously and ordered that no member of the Abdi family would be left off of his aircraft. Abdi, imam of Salt Lake City&apos;s Madina Masjid Islamic Center, is an American citizen with no criminal record. He has given officials no cause to interfere with his basic human right to freedom of movement. That&apos;s a right that accompanies his status as a person, not a citizen. Whoever put the imam on whatever list of banned or restricted flyers should long ago have been forced to come forward and state the reasons for that apparently pointless action, so that it could be challenged and, most likely, overturned in court. But even though the administration&apos;s travel ban on people from six Muslim-majority nations has been blocked by the courts, and even though Kenya is not on that list, we continue to see evidence of official and unofficial discrimination against Muslims in many situations and places. In our system, or in any system of justice worthy of the name, we call individuals to account, not nationalities, faiths or races. That&apos;s true of people who just want to fly home. And true of people who wrongly try to stop them.